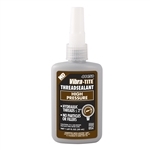 44450 VIBRA TITE HIGH PRESSURE THREAD SEALANT. resisting high pressure and vibrational loosening. Compares with Loctite brand 569.